We stopped by earlier this week during an Aikido Club practice. A group of Cadets from Squad 21 were also in attendance. What is Aikido: Aikido is a highly effective martial art that was established in the early 1900’s by Morihei Ueshiba, a Japanese martial artist who had practiced and mastered many of the old style martial art systems. Ueshiba, spent many years studying the arts of ju jitsu and sword fighting and mastered many weapons such as the spear, staff and bayonet. While it can be used with deadly force the idea of Aikido is not victory or the destruction of the opponent, but resolution of the conflict. 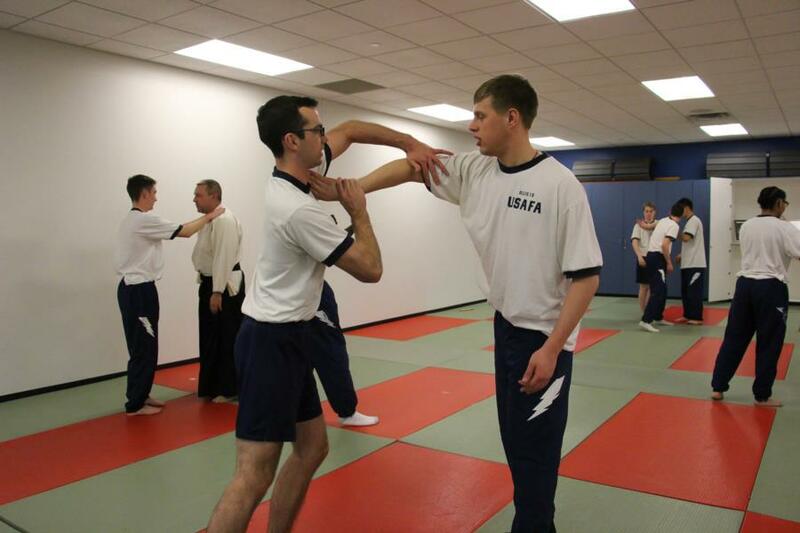 Attacks are evaded and redirected and the attacker is subdued with a pin, joint lock, pressure point or moved to a safe distance with a throw. 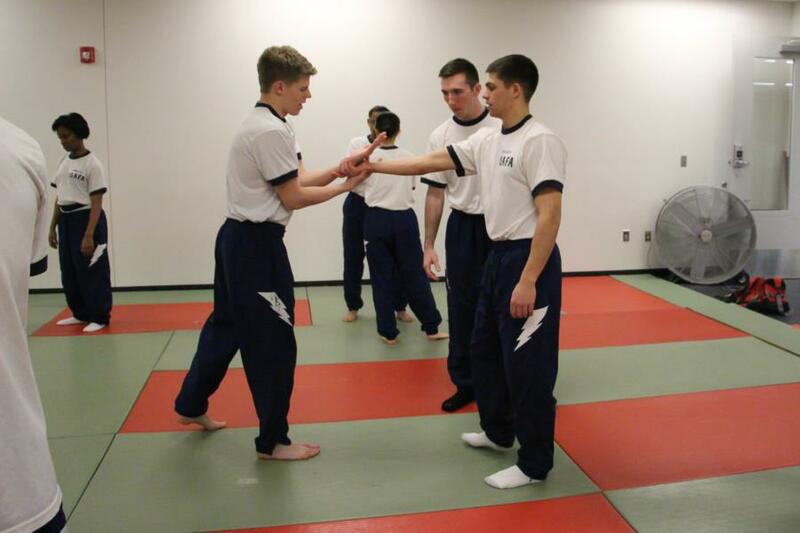 USAFA Aikido Club’s purpose: The mission of the USAFA Aikido Club is to assist cadets in acquiring martial art fighting skills in unarmed combat, personal awareness and the integration of these traits into their Character and Athletic development. 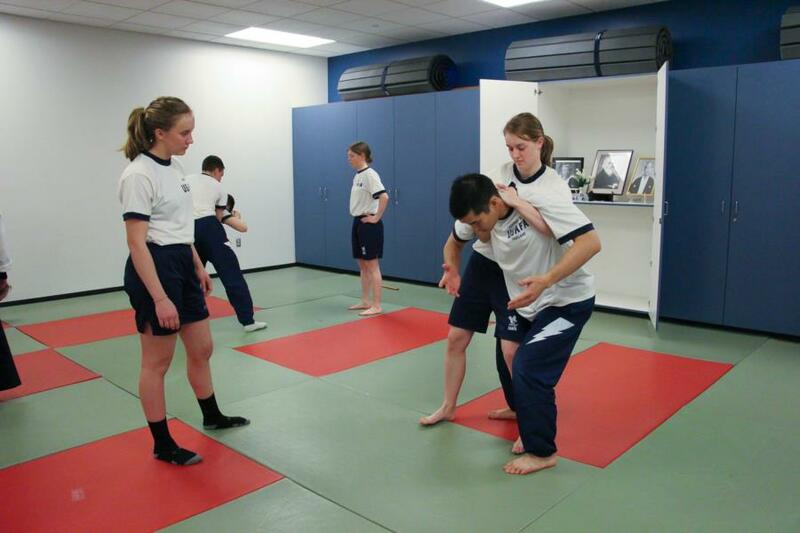 This purpose is accomplished by teaching the cadet’s unarmed combat skill to be utilized in fighting one or many attackers based on the principles of Aikido. Techniques taught also include protection against attacks with a knife, sword, staff or bayonet. 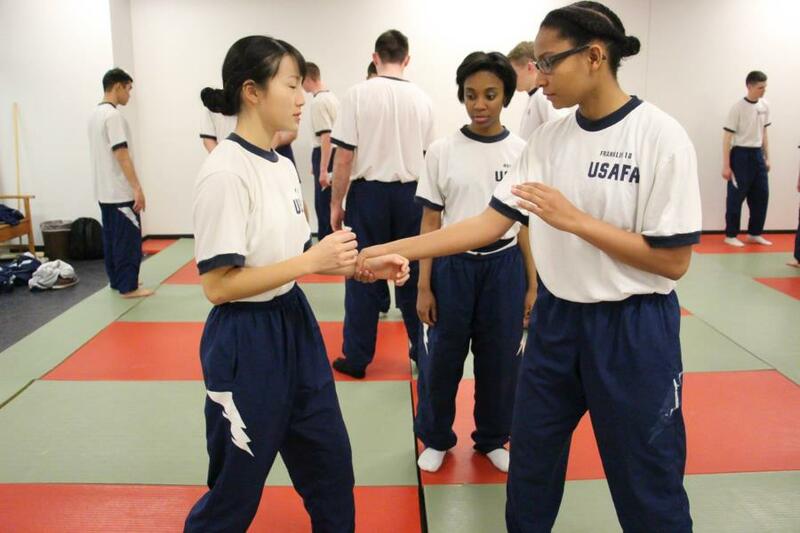 The benefit to cadets is increased awareness, coordination of body and mind, positive attitude and the ability to face uncertain situations with agility and confidence. Skills attained will also benefit development in other athletic areas and training. 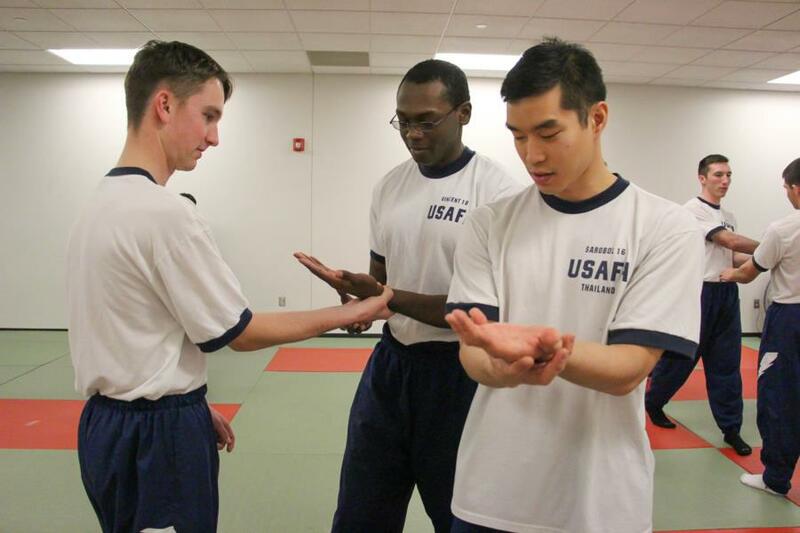 * Enhance cadet professional and unarmed combat development. * Provide opportunities to practice and demonstrate athletic and military skills necessary to produce officers of character. 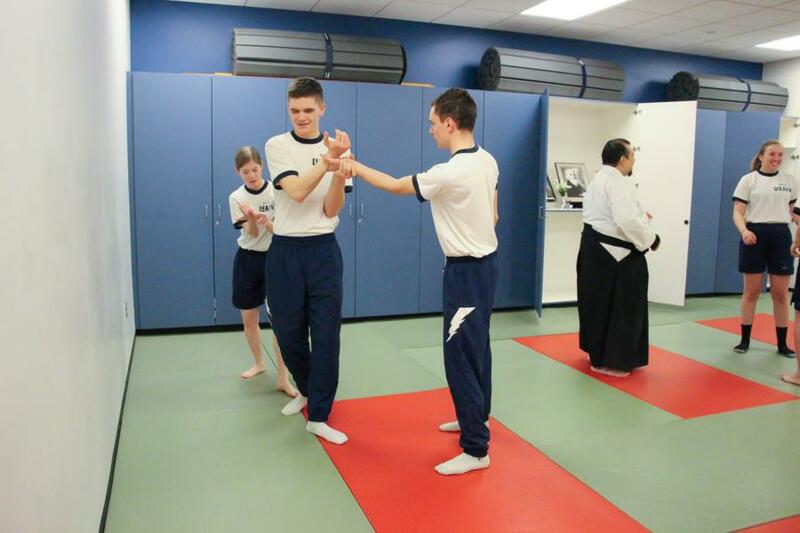 * Provide cadets hands-on leadership opportunities by teaching Aikido Combative Skills. * Provide healthy morale and welfare opportunities that will encourage lifetime participation and wise use of leisure time. Morihei Ueshiba, the founder of Aikido says it best. "Life itself is always a trial. In training, you must test and polish yourself in order to face the great challenges of life. Transcend the realm of life and death, and then you will be able to make your way calmly and safely through any crisis that confronts you“. 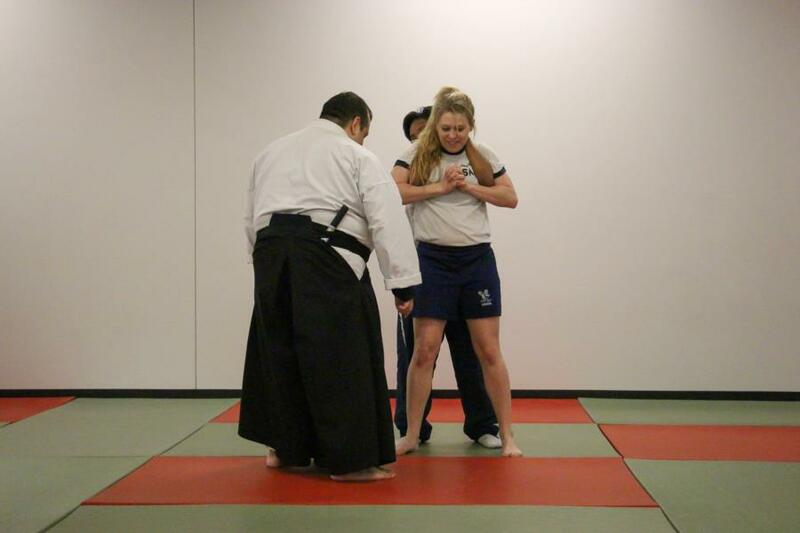 To view the rest of the picture from the Aikido Club practice, go to Galleries - Extracurricular - Cadet Clubs. Or click the link below.